Adventure Mode: The Subspace Emissary (亜空の使者, Emissary of Subspace), sometimes abbreviated as SSE or shortened to Subspace Emissary, is a mode in Super Smash Bros. Brawl, similar to Melee's Adventure Mode. It was hinted at with the This world... Dojo update on July 20th, 2007, and fully unveiled on August 3rd of the same year. The post was placed under a mode referred to as "???" until August 3rd, when it was changed to "Adventure Mode". On August 3rd, Smash Bros. DOJO!! was updated again. This time, more information was given. The mode was dubbed "The Subspace Emissary", and a multitude of screenshots were shown, as well as a cutscene related to the "This World…" update. In the cutscene, Mario and Kirby were seen shaking hands, as depicted in the screenshots, and after waving to the crowd, the Halberd appeared as it did in "This World…". The mysterious character from before was shown to be one of apparently many odd, robot-like creatures formed from some sort of shadowy matter. Peach and Zelda were seen watching from the sidelines, but rushed down to the middle of the stadium to assist Mario and Kirby in fighting the mysterious army. After Peach and Zelda reach the stage and help destroy the Primids, an entity from the sky called the Ancient Minister appears on the stage. The Ancient Minister drops a Subspace Bomb on the arena, then flies off. As Mario approaches the bomb, he is hit by a cannonball and is sent flying from the arena. Petey Piranha appears and captures Peach and Zelda in cages. The various screen shots in the update depicted a multitude of new enemies, as well as a few familiar ones, such as a Hammer Bro, who was previously confirmed as an Assist Trophy, and Bullet Bills. There were also a new series of enemies that were introduced that are part of the Subspace army. Some enemies of the Subspace army appear to be helpful while other ones are dangerous. The Adventure Map, after completion of The Subspace Emissary. A map of the stages and which characters are available in each one, not counting Wolf, Toon Link, and Jigglypuff. The Subspace Emissary consists of 31 different stages. As some stages share the same name, the earlier stage is denoted with a I while the later-appearing stage is followed by a II. The Subspace Emissary mode is a side-scrolling adventure in the style of a platformer, inspired by the Mario and Kirby games. However, it retains all basic mechanics of the Super Smash Bros. series, such as a damage meter, stocks, and Smash-style attacks. It can also be classified as a beat 'em up; often stages will pause at specific points and force the player to defeat a set of enemies, which prevents one from simply running through everything. The mode features a world map where stages are selected; once a stage is selected, the difficulty can be chosen, and the character(s) will enter the stage. The selectable characters will change depending on the plot. Stages that have been completed already can be played again with the exception of some stages where the player must wait until the Subspace Emissary is beaten like Midair Stadium. The mode also has a two-player option. When using two players, the first player will have priority over the screen, making it possible for the second player to get run off the screen if the two players are not coordinated. However, the second player has the option to warp to the first player at any time (except in boss battles) by pressing the button that would normally pause the game. The first player must be present with stock left at all times; if the first player runs out of stock, the game will end and offer a continue, regardless of whether the second player still has stock left. If the second player runs out of stock, the first player can continue alone. In addition, only the first player can navigate through doors (though the second player can still utilize keys) and temporary switches. If the second player goes into a barrel cannon or minecart they will be teleported back to the player seconds later unless the first player goes in right after. The second player can also decide when barrel cannons shoot. When playing a level for the first time, many cutscenes will pause just before gameplay begins, showing a view of all available characters. A message will display how many stock the level allows, and a cursor will appear that allows choosing which characters to play. The order characters are chosen in is the order they will appear: they will cycle through in that order until all stock is depleted. Playing through a level again, there will be a screen before the level allowing choosing between any available characters instead of cutscenes during the level. This can be both an advantage and a disadvantage: there is a wider character variety to choose from, but one cannot (for example) choose only three characters for a four-stock stage. Additionally, no mid-level cutscenes will play, including ones that would normally allow a re-pick of characters which replenishes stocks. While on many levels this makes little difference, it is very problematic on long stages like the second Subspace Bomb Factory, where a replay provides only a fraction of the stock originally given. The physics of many (if not all) characters are also tweaked slightly. In general, characters run slower, fall faster, and jump better than in brawls. However, the midair jumps of a character that possesses more than one will be worse than normal. Move mechanics are not altered, although the differing jump heights, jump timing, and gravity will change how effective aerial attacks are. The most significant change is the removal of stamina from Pokémon Trainer's Pokémon, which allows one to use one Pokémon exclusively. Characters are also able to swim for significantly longer. Characters retain their standard physics in boss battles. Because Smash relies on KOs by being knocked off stage, in order for the platforming nature to be retained, the camera's reaction time in following a character decreases in proportion to the player's damage. Grabbing mechanics are also altered. Normal enemies cannot be held onto for any length of time; they will be thrown immediately after being grabbed, making it impossible to pummel them. This means that choosing which throw to use must be done with the Control Stick during the grab animation; inputting no direction will result in a forward throw (with the exception of Donkey Kong, who cannot carry enemies, and instead will utilize his up-throw). Special moves that involve grabbing will fail to grab like Yoshi and Kirby's standard special moves; such moves have extra Subspace Emissary-only hitboxes (for example, Egg Lay will deal 13% damage, while Pikmin will deal damage when thrown). Bosses and large enemies cannot be grabbed; however, Big Primids can be grabbed effectively. None of these changes apply when facing an opposing Smasher due to playing like an actual Brawl, though Kirby will be unable to copy their abilities. Like most other single-player modes, one can select different difficulty levels to play The Subspace Emissary. At the creation of a new game file, the player may select a "default" difficulty from Easy, Normal, Hard, Very Hard, and Intense. Stages normally use this default difficulty (which cannot be changed), although the difficulty of a stage can be altered before it is begun. The game keeps track of the hardest difficulty level at which each stage has been cleared, and when a stage is selected, it suggests a difficulty higher than the highest completion level. Enemy health goes up, sometimes considerably with bulky enemies like Greaps. Enemies move and attack faster; especially noticeable with the vulnerability period of large enemies and bosses. Additional attacks become available to enemies. Enemies and obstacles do more damage and have more KO power. Some enemy hitboxes are slightly bigger. Enemies are harder to flinch. Enemies generally get smarter (such as attacking more often, or Bytans duplicating nonstop). More (and sometimes deadlier) enemies appear during locked battles. Auroros can't be thrown as far, making it more difficult to use them as javelins against other enemies. Less favorable items appear, although an increased number of stronger healing items appear when enemies are defeated. Stock Balls may get rarer (or, in the case of Very Hard and Intense, not exist, being replaced by recovery items instead). Certain features travel faster, giving the player less reaction time. Barrel Cannons, Slide Launchers, Minecarts, and other vehicles (such as the orange platforms in The Research Facility) move faster, therefore being harder to control. Moving walls, floors, and ceilings move faster, making characters more easily crushed. Platforms move or fall faster. Bomb block explosion chains move faster. The effects of temporary switches are shorter. Wind speeds increase (including the wind from a Borboras), sometimes to nonsensical levels. Keys are easier to break. More, higher quality, and rarer stickers appear. More collectibles (CDs, trophies, stickers) appear. More coins are given at the end of each level. These battles are fought with the bosses having a specific amount of health; once their health runs out, they are defeated. All the bosses return in The Great Maze, the characters that had fought them return to fight them again. Due to these battles being against smashers or slightly modified versions of them, they are fought like regular brawls. Note that the player characters listed are only mandatory for the first playthrough, and that other characters may be used if the level is replayed. Note: When only one character is available to fight a boss or mini-boss in Co-op mode, the second player plays as a color change of that character. This is the only way to play as a color change of a character. This only happens in two battles: Mario/Kirby against Kirby/Mario, and Meta Knight/Lucario against Lucario/Meta Knight. Porky Statue (The Ruined Zoo): it chases Lucas but it does not fight with him. While various characters in the Smash series have one-liners through taunts, battle cries, and the like, the cutscenes of The Subspace Emissary have very little spoken dialogue. The vast majority of character interaction takes place through actions, gestures, and expressions, augmented by short grunts or exclamations. Some cutscenes feature moves that have battle cries where the character says the move's name, such as Ness and Lucas using their PK Thunder or Captain Falcon using his Falcon Punch. The only character who speaks in more than one scene is Pikachu, who only "speaks" via yelling its own name. In Jigglypuff's only scene, the crowd chants its name, making them the only non-playable character to say a line. Only one character in all of The Subspace Emissary ever speaks in a full sentence; in Battleship Halberd Interior, Snake directly says to the player, "Kept you waiting, huh?" after revealing himself. This is a classic line from the Metal Gear series. In Brawl, it references the extensive voicework in the Metal Gear Solid games, the frequent breaking of the fourth wall in the series, and the fact that the player had seen a brief glimpse before already in a much earlier cutscene. The Subspace Emissary contains gameplay elements similar to the sub-games of Kirby Super Star and other elements from Kirby games. This is likely intentional, given Masahiro Sakurai's work on both games. The Halberd plays a very strong role in both games, and in both, it's destroyed and crashes in the ocean. The beginning of the The Ruined Zoo (more specifically the boss battle against the Pig King Statue and Porky Minch) is similar to the Heavy Lobster battle in Revenge of Meta Knight: The player is chased by the boss, who remains invincible for this duration and plows through anything in its path. Following the chase, the boss becomes vulnerable and attacks the player head-on. Both feature cart rides and special devices that propel characters forwards. The latter's design and function comes directly from Kirby Super Star. Additionally, the slide launchers puts characters in a shield position, just like in Kirby Super Star. There are also bomb blocks which function identically to those from the Kirby series. The Space Jump is just like how P2 from Kirby Super Star comes back to P1. The final boss (Tabuu) teleports around the stage repeatedly (a common feature in most final bosses in Kirby games, such as Marx and Nightmare). Bosses from the Kirby games, such as Dyna Blade and Marx, have similar moves to bosses in Brawl, such as Ridley and Tabuu. Enemies cannot survive underwater; they will be KO'd immediately upon touching it. Roaders are similar to Kirby's Wheelies. The planet Floria in Milky Way Wishes has a similar concept to the day-changing doors, except that it has four rooms and they are based on seasons instead of day and night. The walking speed, running speed, and air speed of most characters has been normalized; slower characters move faster, while faster characters move slower. This is quite noticeable with Captain Falcon and Sonic's dashing. Player 2 will receive a significant walking speed, running speed and jump height increase as their distance from player 1 increases. This is presumably to prevent them from falling behind too much, but happens regardless of whether they run ahead or fall behind. All characters jump 2 frames faster, jump 18% higher, have slightly higher gravity, and have a 19% faster falling speed. As a result, vertical movement is in general faster, while some characters' recoveries (such as Jigglypuff and Pit) are indirectly nerfed by the heavier physics. Peach's double jump has 40% more force; no other character has a change of more than 10%. Fox is the only character to have a shorter double jump as it has 5% less force. Some special moves that grant temporary hovering, such as Diddy's Rocketbarrel Boost, can't keep up with the increased gravity and so are also indirectly nerfed. During side-scrolling stages, the player cannot get Star KO'd - the player crashes into the top of the screen, leaving behind the colorful explosion. Players are only Star KO'd or Screen KO'd in ambushes, boss battles, and fights against Subspace clones. All characters can swim considerably longer. The Stamina mechanic of the Pokémon Trainer's Pokémon is removed. Grab-only special moves such as Inhale and Egg Lay deal damage to enemies instead of grabbing. In addition to blocking most attacks, Mirror Shield can also now do damage. Mario's trophy coming to life in Melee's opening, compared to in the Midair Stadium of the Subspace Emissary. While the mode effectively encourages players to use almost every character in the game, it is possible to complete The Subspace Emissary using as few as thirteen characters, or barely one-third of the roster: Kirby, Pit, Lucas, Marth, Zero Suit Samus, Snake, Meta Knight, King Dedede, Diddy Kong, either Link or Yoshi, either Samus or Pikachu, either Olimar or Captain Falcon, and either Peach or Zelda/Sheik. Palutena is the only character in The Subspace Emissary who is neither a villain/enemy nor playable. As far as playable characters go, Wario, R.O.B., and Sonic are the only universes that do not have a song played at any time. In addition, Star Fox (excluding the hidden room in The Ruins) and the universes mentioned above are the only universes that do not have a song played in normal gameplay. Mario and Kirby are playable in more levels than any other character, with a total of nine. 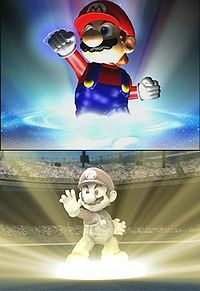 The opening battle between Mario and Kirby in The Subspace Emissary may be a reference to the opening movie of Super Smash Bros., where the two face each other near the end of the movie. In addition, Mario's trophy coming to life in the first cutscene could be a reference to the beginning of Melee's opening movie. The Subspace Emissary is the first mode in the Smash Bros. series thus far that allows players to unlock characters without a challenger approaching battle. The second is SSBU's World of Light but it still requires the player to fight the character that will be unlocked. 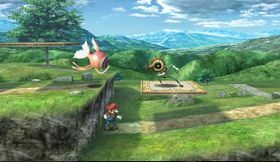 The Subspace Emissary is mentioned several times in Super Smash Bros. for Wii U in Palutena's Guidance during the conversation of Mario and Mr. Game & Watch and the North American English boxing alias for R.O.B. Also, some enemies from The Subspace Emissary return in Super Smash Bros. for Nintendo 3DS's Smash Run mode. The Subspace Emissary is also referenced in one of the riddles regarding Tabuu, located in the Mysterious Dimension sub-world of World of Light. The health bars for enemies (not including bosses) are compressed at the left hand side, so a length of health bar represents more health at the left of the bar than the right. This makes attacks appear to deal less damage the closer an enemy is to dying. This page was last edited on April 14, 2019, at 09:32.